Public relations and communications professional Xina Eiland and I met during the Blogalicious Weekend Conference’s opening night reception held at the W Hotel in Atlanta in 2009. While sipping cocktails and recording video interviews, we learned we were both born in Michigan and currently living in the Washington, D.C. metropolitan area. Throughout the conference, we reconnected with each other and other women like “WhimsiGal,” founder of Whimsicard, LLC from the D.C. area. When we returned home, we used social media tools like Twitter, Facebook, and LinkedIn to stay in touch. We also discussed our Blogalicious experiences on Digital Sisterhood Radio, my Internet radio show. And then it happened. We reached out by telephone and agreed to meet face-to-face in D.C. Our first meeting occurred on a Sunday afternoon at the U Street Café in December 2009. Xina, “WhimsiGal,” and I sat at a table for a few hours discussing our lives, life goals, ways we could support each other, and ideas for a local Blogalicious meet up. That one conversation paved the way for our Blogalicious D.C. community building efforts. Together, we were able to help the Blogalicious co-founders organize two D.C. meet ups in February and April 2010. Xina played a major role in securing space and media coverage, promoting the events on Facebook and Twitter, identifying speakers and sponsors, developing the agenda, and obtaining in-kind donations for both events. I served as panel moderator for the April meet up. In addition to supporting the Blogalicious D.C. community, we also made a professional commitment to support each other and our business goals. We launched our commitment with a breakfast meeting at Busboys and Poets, a popular D.C. hangout, in January 2010. Seated on comfy chairs with herbal tea and delicious breakfast items to keep us company, we shared our expertise. Xina became my public relations coach. She convinced me to follow her instructions on branding for my books, artwork, yoga practice, speaking and sponsorship opportunities, and coaching services. I became her creativity coach and helped her develop a social media plan to support her intention to blog and learn more about social media tools. Throughout 2010, we met monthly to assess our progress and seek feedback. We attended several D.C. social media meet ups, participated in the Blogging While Brown’s White House Visit and weekend conference, hung out at the Red Pump Project and Blogalicious’ Say RED: Cocktails and Conversations event, and live blogged with the Blogalicious D.C. B-Link members during President Obama’s education reform speech at the National Urban League’s Centennial Conference. 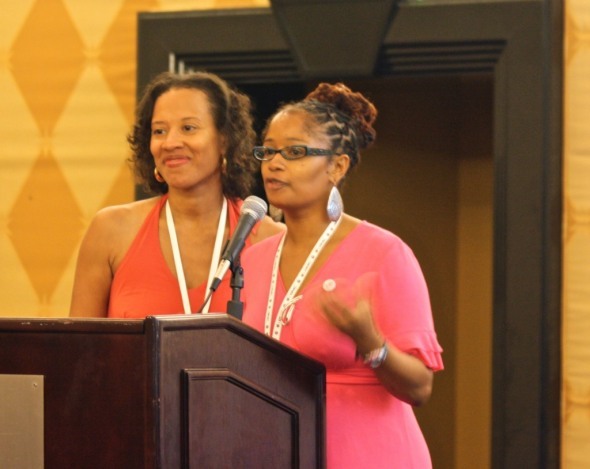 We also traveled to Miami to attend Blogalicious’ second annual conference and served as co-moderators of an open-mic luncheon sponsored by McDonalds. Xina and I had an amazing time moderating the open-mic luncheon. It was a soulful discussion that included personal testimonies and stories shared by women who were Blogalicious newbies and alumni. They opened their hearts and spoke with such passion, clarity, candor, and humor. Their collective energy made it a beautiful experience filled with wisdom, laughter, lessons learned, and a plethora of blogging experiences that revealed how women discovered their authentic selves and voices online and offline through the support of other women. When I look back on the experiences Xina and I shared in 2009 and 2010, I realize the greatest blessing was the way we constantly encouraged each other to step up our game and pursue new opportunities. We also shared information, insights, and introductions to people in our network that could support our efforts. We laughed, learned, and listened to each other when we achieved and struggled. Our Blogalicious bond created a digital sisterhood that supported us in 2011 and continues to support us in 2012. What a blessing! Digital sisterhood is one of the many gifts you will receive when you attend a Blogalicious conference, meet up, Twitter chat, or webinar. Once you attend one event, be prepared to attend more because Blogalicious is positively contagious! It’s also magical. Why? Through the celebration of Blogalicious’ diversity, women own who they are through the content, connections, communities, collaborative partnerships, and commerce they create as they share experiences, insights, opinions, humor, creativity, expertise, and information. Excerpt from Ananda Leeke’s forthcoming memoir, Digital Sisterhood: Fierce Living Online for 25 Years (late Fall 2012). Thanks Justice Fergie and the Blogalicious team for sharing my testimony about the power of Blogalicious! Looking forward to connecting with everyone in Las Vegas! Wonderful story. Congrats on your upcoming memoir. Thanks Krystal! Sending you lots of positive energy and best wishes on your fabulous efforts and family! You have an amazing memory my sister. Wow, we have such a short but long history together. Blogalicious is truly a sisterhood. My involvement has created lifelong relationships with incredible people like you. You’re an amazing blogger, woman and friend. I thank God for having you in my life. FYI, remember my birthday gift? It is displayed proudly in my living room. It was too precious for me to bury it in a jewelry box. I see it every time I walk into that space. Lots of love my sis, Xina. What an inspiration! I was running around like a mad woman at BlogHer ’12 and don’t think we got to meet but remember seeing you. 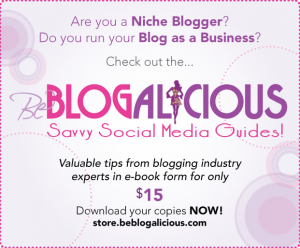 Look forward to connecting at Blogalicious!